Since 2007 Greencyc has seen a dramatic shift in the after sales mobile phone market. With ever increasing environmental obligations, what was previously a 'throw away' phone is now a product which can be put through a number of processes in order to get it back into the re-use market. We are all aware that mobile phones have advanced over recent years and with the release of smart phone technology, people are now upgrading their phones more often. This has moved them away from being a throw away item to something which has a re-use value and a phone can actually have a number of owners throughout its life cycle. Greencyc's specialism is in the processes involved to put mobile phones back into market. Recycling is all about re-use and at Greencyc we aim for zero landfill. There is always a demand for old mobile phones somewhere on the planet, be it as a complete working unit or as component parts to be used in a repair or refurbishment process. 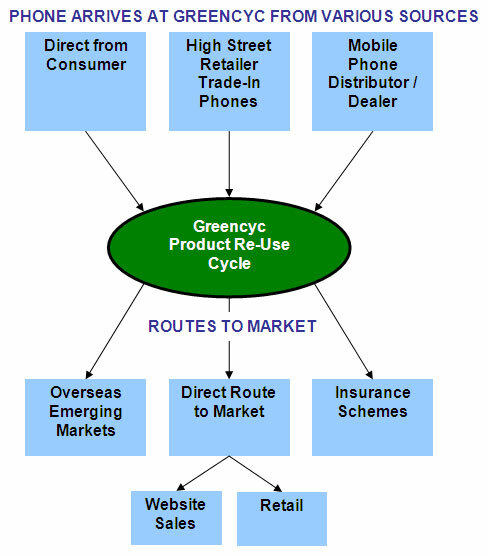 The following diagram outlines the journey of a mobile phone from the receipt at Greencyc to its new route to market for re-use.